Let’s start with a quick recap. So far, we have learnt about how reading a wide range of materials from young and reading with a specific purpose in mind can help strengthen your child’s Chinese reading comprehension ability. In this blog post, we delve deeper into comprehension passage reading techniques. In particular, through reading questions smartly, your child can uncover useful hints to help him or her find the correct answers more easily. READ PASSAGE OR QUESTIONS FIRST? At KidStartNow, we advocate the following process for reading comprehension. The aim of the first read is to get an overall understanding of the passage, and to identify its broad theme, topic or storyline. Understand what the questions are asking for or about. Identify and underline the question words (疑问词) in the questions (i.e. the 5W+1H questions; see more details below). With the second read of the passage, identify where answers can be found in the passage. Mark out the sentences where answers are found by underlining or highlighting and writing the relevant question number next to it. Annotating a passage becomes especially important in upper primary levels when the student may need to derive the answer for one question from different paragraphs of the passage. With highlighting or underlining all parts of the answer, your child is less likely to miss out any part and lose precious marks as a result. Unless your child is much older, such as being in secondary school, or he or she is running out of time during a timed assessment, we do not recommend reading the questions without first reading the passage. A comprehension question is made up of question words (疑问词) and keywords (关键句子). The basic question words (疑问词) used in questions can offer useful clues to finding the correct answers in the passage. These question words are commonly known as the 5W and 1H (see table below). Each question word has a different purpose. Guide your child to understand all five different question words and their purposes. Question words (疑问词) What is it asking for/about? When answering questions with basic question words, especially at the lower primary levels, it may be possible to lift answers directly from the passage. However, remind your child to always ensure that he or she answers the question to the point. This could mean having to paraphrase the answer in order to address the question directly. Some Chinese words exist in pairs because of the nature of Chinese sentence construction. So, one way to look for answers in the passage is to find words which are associated with the basic question words. For example, “因为” ( “because”, signifying reason) is often followed by “所以” (“therefore”, signifying the result or outcome) in a comprehension passage. So, when tackling a “为什么” (“why…result/outcome”) question, look for sentences with “因为…所以” (“because”…. “therefore”) in the passage. Question words typically get more varied, complex and difficult from Primary 3 upwards. This applies especially to inferential questions, questions that require the student to answer from his/her life experience, or questions that ask for personal opinion. For such higher-level questions, it is not so straightforward as to lift the answers from the passage. Your child will likely need to infer and deduce from reading the whole passage, or apply critical thinking skills and his or her own personal life experience. This is where reading Chinese books from young, conversing in Chinese regularly and being exposed to rich experiences outside of school can make a difference. Keywords (关键句子) forms the main part of a question. They also hold the key to helping your child find the correct answer in the passage. Guide your child to look for similar keywords that appear in both the question and passage. If necessary, adapt the answer by paraphrasing it to address the question directly. Generally, teachers set reading comprehension questions chronologically. Assuming a passage with five paragraphs and four questions, for instance, the answers to the first two questions are likely to be found in the first half of the passage, and the last two questions in the second half. Observing the question number can help to narrow down where an answer to a question might be located in the passage. Students often end up losing precious marks because of incomplete answers. How to know how long your child’s answer should be? Look at the number of marks allocated to the question. If it is a one-mark question, most likely one answer is sufficient. For questions with two or more marks allocated, there probably needs to be two or more parts to the answer, to make it complete. Two other common pitfalls that result in students losing marks in reading comprehension is the omission of words and words being copied wrongly. Whether your child is lifting an answer directly from the passage or adapting the answer slightly to suit the question, remind him or her to copy words from the passage to the answer field carefully. At KidStartNow, our teachers get our students to practise silent reading when checking through their reading comprehension answers. They read silently to themselves what they have written, word for word. This helps to prevent students from just glossing over their copied words quickly. We have shared with you a wide array of techniques and tips that our teachers have found useful in helping our students improve in their reading comprehension. Have a go at getting your child to apply them and let us know whether they work equally well for your child! If you would like us to share tips on other aspects of Chinese learning, please also write in to enquiry@kidstartnow.com to tell us! Seeking professional Chinese coaching in a fun and encouraging environment for your child? Fill up the contact form below or call 6481-1932 / 9820-7272 to sign up for a trial class today! Welcome to another new school year! For those parents with preschool children, you might be wondering how you can help your child build a strong foundation in Chinese and Hanyu Pinyin this year to prepare for P1 in the near future. For those parents with Primary 1 children, whether your child has attended Chinese enrichment or not during his or her preschool years, you might be considering to sign your child up for Chinese tuition this year to help him or her cope better in primary school. With so many Chinese tuition and enrichment centres out there, what should you look out for when choosing a Chinese enrichment programme for your child? How do you look beyond marketing brochures and websites to find out if a programme is really suitable for your child? Here’s Part 1 of a checklist to guide your search. What to look out for in a Chinese enrichment programme? For preschool kids, does it prepare your kids for Primary One? For primary school kids, does it follow the latest Ministry of Education (MOE) Chinese syllabus 《欢乐伙伴》closely? Does it utilise a variety of engaging and effective Chinese learning resources that are fun and appeal to students? Are the lessons interactive and engaging? Did you know that that the latest 2015 MOE Chinese syllabus puts a heavy emphasis on oral communications skills. In fact, oral has a higher weightage compared to composition and it is important to prepare your kids accordingly, especially if your kids speak predominatly English at home. Hence, at KidStartNow, our preschool programme prepares students through lively lessons incorporating dramatic role-play and oral practices, which build up your child’s confidence in conversing in Mandarin. This, combined with our reading and writing exercises, means your child is well-prepared for primary school. At the primary level, besides being aligned to the MOE syllabus, our lessons incorporate regular oral practices to ensure that your child gets a head start in learning what is required of him or her in school. Traditional methods of learning Chinese that involve heavy memorisation just takes the joy out of learning Chinese. At KidStartNow, your child learns Chinese the smart way, not the hard way. There is no boring rote learning and drilling by flashcards. Instead, your child learns faster, absorbs and retains more while having fun. This is why we have developed our signature preschool programme around our proprietary animation stories that cater specially for children of this digital age, while learning words taken from the primary school syllabus. Filled with wacky characters, the stories are humourous and exciting and naturally appeal to young children’s innate sense of adventure and curiosity. Our students have so much fun during lessons that they don’t even realise they are picking up new vocabulary, grammar and sentence construction through watching these animations. Games form an important part of our lessons too! Through playing fun games that are integrated with our animation stories or other classroom activities, your child gets to interact with the teacher and classmates in a stress-free context. A self-motivated, self-directed learner makes the best student. Hence, our games also tap the natural sense of competition and drive to excel in children. Your child earns digital coins as rewards for various achievements, which are added ‘live’ to his or her digital bank account and shown instantly on the TV screen in the classroom. This has proven to motivate our students to pay more attention in class, volunteer to speak up in class more often, answer questions and do his or her work more conscientiously. In KidStartNow’s Primary School programmes, we adhere to the MOE Higher Chinese syllabus, focusing on the problem spots of composition, comprehension and oral. Having said that, we ensure classes are not boring and dry by creating an interactive class via our proprietary classroom apps. For instance, kids are divided into teams and answer questions to build a digital hamburger, making the usual boring material fun and engaging! Don’t take our word for it. Why not let your child experience a trial class at KidStartNow to see if our programme and teachers are a right fit for him or her? Make that two trial classes, as we are running a special promotion now of only $19 for two trial classes! Limited classes and seats only. Simply fill in your details below and one of our friendly staff will get in touch with you! We’ve given you a low-down on some of the factors that you can take into consideration when you are exploring Chinese enrichment programmes for your child. Stay tuned to our next blogpost for Part 2 of our checklist of questions to bear in mind when you are visiting potential enrichment centres. Do you have a child between three to six years old who doesn’t speak much Mandarin and doesn’t like Chinese? Do you wish to nip this disdain in its bud before your child reaches Primary 1, but don’t how to help him or her? You are not alone in facing challenges with your child’s Chinese learning. The parents of the three children quoted below also shared your struggles in the past. The turning point came when their children joined a transformational speech and drama holiday camp at KidStartNow. Want your child to experience the same transformation and start falling in love with Chinese? Then read on to find out more about KidStartNow’s signature speech and drama holiday camps for three- to six-year-olds, happening this November and December! It involves interactive storytelling, active show-and-tell and imaginative role-playing that are perfect for kinesthetic learners (which applies to most pre-schoolers!) Learning Chinese no longer feels boring! It builds oral confidence in a fun way. Learning Chinese feels like playtime! It sets learning Chinese and practising spoken Mandarin in context. Through contextual learning, children are more likely to know how to put into practice what they have learnt in similar scenarios in real life situations. It prepares your child for P1 show and tell by developing the oral confidence and vocabulary foundation that are critical for success in school. 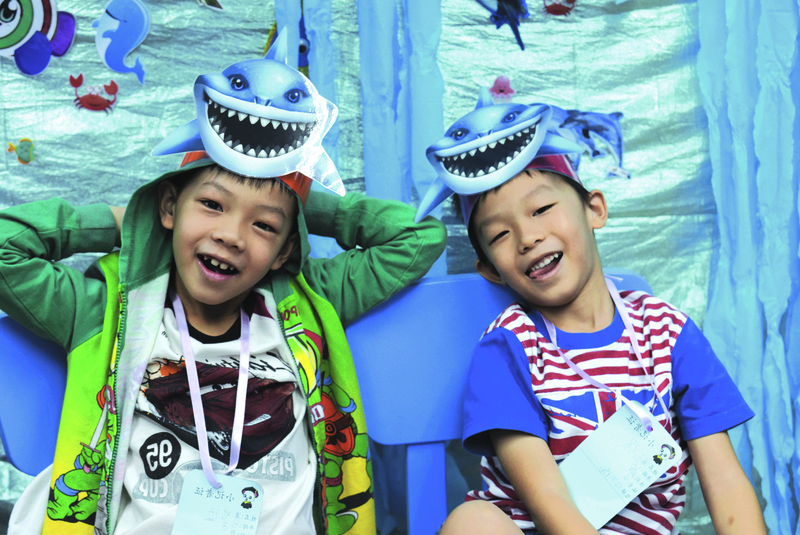 For the upcoming camps, the theme turns festive – Christmas with a touch of adventure! Why is Christmas in danger, and what has a greedy wolf got to do with it? Your child’s got to be in the camp to find out! Each of our speech and drama holiday camps for three- to six-year-olds takes place over four mornings, 3.5 hours per day. Your child can look forward to lots of storytelling, music, games and activities, and speech and drama. You can be sure there will be plenty of opportunities for him or her to practise speaking Mandarin. With such an action-packed, fun-filled programme, it is little wonder that KidStartNow’s speech and drama holiday camp is the #1 rated Chinese holiday camp on Google and also highly recommended by 20 parent bloggers! Don’t let your child miss out on an intriguing Christmas adventure! Places in our camp are limited to ensure we give your child our utmost attention. With so many curious children wondering what has happened to their favourite season of the year, spots are filling up much faster this year than expected!! So sign up quickly today by filling up the form below, and one of our friendly staff will get back to you with all the details. Alternatively, you can also call 6481-1932 / 9820-7272 for enquiries. In addition, if you confirm your sign-up BEFORE 1 NOV, we will be happy to provide you with a SPECIAL EARLY BIRD RATE! This is part 1 of a three part series – check out part 1 and part 3 here. Instilling a habit of reading Chinese books in your child from young is fundamental to doing well in Chinese reading comprehension (阅读理解) later in school. However, not only the types and quantity of materials he/she reads matter, but also how he/she reads them and your parental role in the reading process. In this blogpost, we highlight ways to read and decode stories and comprehension passages effectively. As a parent, you play twin roles in the reading process. Firstly, give your child the space and time to do child-directed reading; follow his/her lead in what interests him/her. Secondly, be his/her reading support, guide and model. Make use of the interesting elements to guide him/her to expand his/her thought process. Engage your child in ‘guided reading or storytelling’ (导读), and not just passive story-reciting (朗读). We understand how tempting it can be to treat reading with your child as an item on your task list to tick off, especially at the end of a tiring day at work and home, as your bed is calling. However, do try to resist the temptation to flip over the cover page right away at the start of each reading session and make a beeline for the last page of the story book. Instead, aim to make each reading session a two-way dialogue discussion, an interactive sharing experience (讨论分享) and a joyful parent-child bonding opportunity. Introduce the title, author and illustrator’s names. Ask your child what he/she thinks the story is about. Get your child to pick out details that catch his/her eyes and express why they are interesting to him/her. Go beyond highlighting details to elaborate on the specific meanings of different visual cues (e.g. why the author/illustrator uses certain elements, different colours, different sizes, different positions). For a spot of fun, you can also print the cover picture, cut it up into many pieces and make it into a jigsaw puzzle for your child to do. This can help to sharpen his/her observation skill. As you delve into the story, you can do role play and read the story together collaboratively, if your child is old enough to recognise the words. The 5W+1H questions – who (谁/什么人), what (什么东西/什么事情), where (哪里/什么地方), when (什么时候), why (为什么) and how (怎样). “How do you know that?” (你怎么知道? )/”Why do you think so?” (为什么你这么认为？). This is possibly the most important question to ask your child as it trains his/her analytical, deductive and inference skills. It also enables you to understand his/her thought process. Ask your child what the moral of the story is, whether the subject is doing the right thing, what lesson he/she can learn from the story, or what he/she would do if he/she was the subject of the story. Scaffold your questions progressively, from easy to hard, and be sensitive to the age of the children. Avoid plunging right into deep questions from the start. Always be encouraging, and don’t be too quick to correct a wrong answer. Aim to create a positive reading and learning experience every time. Such guided reading is beneficial not only for reading comprehension, but also for the latest PSLE composition writing and oral format, as well as critical thinking in general, in the long run. Unlike the English language, Chinese words (词语) are usually formed by and derive greater meaning from combining two or more characters (字). At KidStartNow, we teach our students to read word by word (词语), not character by character (字). This is to help them understand the context of each sentence in the paragraph and the meaning of each paragraph. You can practise the same technique when you are reading with your child at home. Another plus point about reading word-by-word is this – even when he/she sees a word or character in the middle of a sentence that he/she does not know, he/she can skip it and move on to other parts of the sentence or passage to try to understand the larger context. With contextual understanding, it will help him/her make an educated guess of the meaning of the word that he/she does not know how to read. What about students who get turned off by having to read long paragraphs of text during comprehension exercises? During KidStartNow’s lessons, our teachers break the class into two or more groups and pit them against one another to read the passage or paragraphs in turn. When one group is reading, the others listen attentively to check if the group is reading correctly. Teachers record the teams’ scores using a quiz-based teaching app. This competition format motivates our students to pay attention in class and try to do better in comprehension. We have covered tips on what to read and how to read story books and passages to aid comprehension. If you’ve found this post useful, please share it with your friends. Look out for our next blog post where we will share tips on how to read comprehension questions as the next important key to answering these questions effectively. Let your child experience how our teachers coach our P1-P4 students in a fun and exciting setting. Fill up the contact form below or call 6481-1932 / 9820-7272 to sign up for a trial class today! This is part 1 of a three part series – check out part 2 and part 3 here. Does your child struggle with Chinese reading comprehension (阅读理解) in primary school? Reading comprehension not only tests students’ ability in understanding the Chinese language, but also in applying it. Not surprisingly, students often see it as the most difficult section of the Chinese Paper 2 to do well in. Stay with us for the next couple of blog posts to pick up some useful strategies, techniques and pro tips that you can use at home as you coach your child. Firstly, help your child interest in Chinese and build a strong foundation in it through cultivating a reading habit from young, even before they step into P1. Yes, mastering comprehension starts with reading! As your child gets exposed to more Chinese books, he/she learns to recognise more words, know more vocabulary and become familiarised with common Chinese sentence structures (which differs from English ones). In turn, these help your child understand the comprehension passages that he/she reads. Now, you might wonder, what kind of reading materials will suit your child? Read picture books (绘本) if you have a very young child. Picture books generally have a bigger illustration-to-text ratio. Some of them can carry so few words that you might wonder if they are worth reading or buying. In actual fact, picture books can be read at different depths to suit children of different ages and levels of Chinese proficiency, even right up to upper primary levels. We will share more on how to get the most out of reading Chinese picture books in the next blog post, so stay tuned! Read graded readers (分级书) with your K1 or K2 child. These readers are designed to cater to different reading levels. The levels start from emergent/beginner through advanced/independent level, with increasing number of words. As your child enters primary school and builds up wider vocabulary, gradually encourage him/her to progress to other bridging books (桥梁书), which are usually simple, short chapter books with smaller illustration-text ratio. Hanyu Pinyin – with or without? Do you get stumped over whether to choose books with or without hanyu pinyin (汉语拼音)? The most important factor to consider in choosing books is still based on their content and value – whether the storylines are interesting, engaging, appealing to your child, encourage thinking and conversations, and teach good values. Then, prioritise those without hanyu pinyin over those with, wherever possible. Your child will get a lot more practice in having to recognise and remember Chinese words this way and not just rely on hanyu pinyin to read. Invest in a dictionary to look up words if you need help in this area. Dictionary-checking is also a useful skill to teach your child. What if your child has not formed a regular Chinese reading habit by the time he/she enters P1? Get him/her into the habit of reading the MOE Chinese textbooks 《欢乐伙伴》 every week at home, at least three times weekly. This will help in revising and remembering what he/she has learnt in school. Make it a fun activity by taking turns to read alternate lines or paragraphs with him/her, or do role-play. Reinforce by co-watching the animations with him/her, listening to the songs and doing the quizzes at 学乐网, MOE’s repository of digital resources that complements the 《欢乐伙伴》 syllabus. Another reading resource is the popular Chinese magazine 《好朋友》(for P1 to P2 students)/《知识画报》(for P3 to P4 students)/《知识报》(for P5 to P6 students), also written based on the 《欢乐伙伴》 syllabus. You can subscribe to it through your child’s school or via Etutor’s website 知识网. Encourage your child to read the magazines at home after he/she has done the exercises in the magazines in school. You can also read the levelled e-readers with him/her and try the online quizzes, if the subscription includes digital resources. Check out Chinese comics such as 《闹闹漫画乐园》, 《这一班日记》and《又是这一班》at the local libraries or bookstores. Written by local authors, these stories are full of local flavour and humour. As your child can easily identify with the characters, places and situations in the comics, they may be more willing to read them over more text-based Chinese books. Explore animation storybooks such as the Boshi Panda 《熊猫博士》 series developed in-house by KidStartNow. You can access the storybooks via a monthly subscription. New titles are added every month. Or, sign your child up for our preschool classes (N2 to K2) at KidStartNow and he/she will get to learn new vocabulary and sentence structures through these animation storybooks during lesson every week. These storybooks are a hit with our young students as they appeal to their natural curiosity and interest in magic, adventure and travel to sustain their interest from episode to episode, lesson to lesson. That’s not all. As KidStartNow’s student, your child also gets online access to the animation storybook that is taught in class after each lesson is over. Co-watch the episode with him/her as revision. He/she can even earn digital coins in his/her individual ‘digital bank account’ when he/she answers the word recognition quizzes correctly. Say yay to no more nagging him/her to do revision at home! Now that you know the wide range of reading resources out there, keep your eyes peeled to our blog as we share how you can get the most out of reading with your child through ‘guided reading’ (导读) in our next post. Share this blog post with your friends if you’ve found it useful.If you would like to find out more about KidStartNow’s animation storybook-based classes for N2 to K2 or our primary school classes, please fill up the form below or whatsapp us at 9820-7272 now! If you’re reading this article, chances are that you’re facing certain difficulties in getting your child to learn Chinese. Maybe your child doesn’t have an ounce of interest in the language. Maybe your child is doing relatively okay in all of his/her other subjects, but is getting abysmal grades in Chinese. Maybe your child is highly stubborn, and replies you in English even when you speak to him or her in Mandarin. We’ve seen many parents who, discouraged by the above scenarios, give up and admit defeat. They tell us that they’ve tried everything, and that it’s simply impossible to get their child to learn Chinese when he or she has already developed such an intense dislike of the language. Many parents say that they’ve tried everything, but what they really mean is that they’ve tried the same thing over and over again. Let’s say they rely on flashcards to get their child to memorise Chinese vocabulary. They might try using the flashcards at the start of the week, only to be met with a refusal to learn from their child. Undeterred, they try the flashcards again, this time with an external reward involved – they’ll get their child a new phone if he/she manages to improve their Chinese grades. Still no luck. They try the flashcards yet again, this time on a weekend, hoping that their child will be better rested and more open to learning. It still doesn’t work. You can’t expect different results to arise when you’re doing the same thing, over and over again. Think about it – you won’t lose weight if you don’t make changes to your exercise and eating habits. Similarly, you can’t expect to achieve that “breakthrough” with your child if you continue using outdated methods of teaching. Continuing in that same vein, this is the one biggest mistake that parents make when teaching their kids Chinese – which is utilising the same methods that were popular 10 or 20 years ago. It’s 2017, and an overwhelming majority of Singaporeans speak English at home. Yes, you might argue that your children speaks Chinese when interacting with their grandparents, but that isn’t sufficient for them to familiarise themselves with the language, or to develop an interest in it. Even if both parents are bilingual, this often has no bearing on whether your child ultimately ends up accepting the Chinese language – unless you make a concerted effort to speak Chinese regularly (and this means approximately 50% of the time) at home. How do you get children to develop an interest in Chinese, then? Simple. Refrain from any activities that involve learning through mindless repetition (死背), and instead, opt for more interactive formats of learning, such as hosting show and tells in Mandarin, and doing roleplaying exercises. Whilst these will take more effort to plan on your part, they’re significantly more engaging, and will do wonders in helping your child develop a liking for the Chinese language. If you want to supplement your efforts at home with Chinese enrichment classes, similarly, make sure you choose an enrichment centre which utilises interactive forms of learning over memorisation and mindless repetition. At KidStartNow, for example, we utilise a gamification system, where kids are given digital coins when they participate in class or do homework. Each student’s score is tallied up on a scoreboard that is displayed in class, and this motivates them to keep participating in an effort to achieve a “high score”. You’d be surprised at how competitive kids can get, and how effective gamification is in motivating students to fast-track their learning. In fact, this is applicable to not just young children, but students of all ages – with similar gamification being techniques employed by leading US universities such as New York University, University of Michigan and Indiana University. Remember: you can’t expect your children to have a radical change of heart when it comes to Chinese if you’re still sticking to outdated methods of teaching. Our system has helped over 1000 students and we are so confident in our system that we offer a 30 day full money back guarantee on our enrichment classes. So bring your child down to KidStartNow’s trial class, and you’ll be able to see for yourself. 95+% of children who go for our trial class find it extraordinarily fun and will request to come back for more sessions. Register your child for a slot today! Give us 4 days, and we’ll give you a child who loves Chinese. This June holidays, we’re bringing back our KidStartNow Superhero June Holiday Camp by popular demand! With the astonishing difference that this camp makes on children’s attitudes towards learning Chinese in just 4 days, the camp has earned rave reviews by numerous mummy bloggers such as Says! Happy Mums, Kids R Simple and Lil Blue Bottle. This camp has consistently sold out since its inception in 2013 – so sign up early to avoid disappointment! All in all, our super popular camp have been highly recommended by 18 parent bloggers, and was even featured by Young Parents’ as “Enrichment class that best nurtures your child’s interest in Chinese”. How does the Superhero Holiday Camp engage my kids? By utilizing a fun storyline that makes children forget that they’re learning Chinese! Over four days, your child will go on a story adventure where they will meet a pair of panda superhero siblings who are constantly fighting. The siblings are forced to band together to save a baby panda from an evil robot wolf, and in doing so, they learn the importance of love and cooperation. 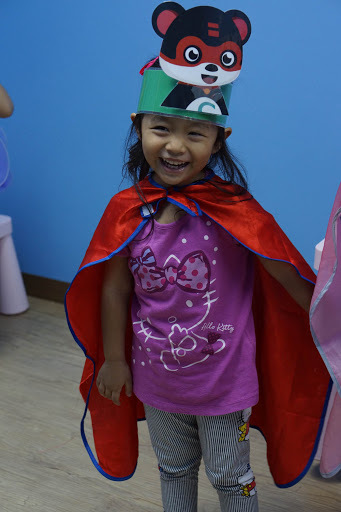 Every day, your child will be engaged with 30 mins of story-telling, followed by an hour of fun games and activities to reinforce materials, and end off with 30 mins of roleplaying where your child will pretend to be a character in the story and act out the dialogue (in Chinese!). It’s a great way to help your child forget they are learning Chinese. Before the camp even commences, your child will get postcards mailed to them. These postcards contain a teaser about the storyline, and ask your child to start thinking of ideas to save the baby panda. What ages are the Superhero Holiday Camp suited for? The camp is split up into two sessions, which are catered to 3-6 year olds, and 6-8 year olds respectively. Those in the younger age group will be focusing on role-playing and oral conversation in order to cultivate a strong interest in Chinese. Those in the older age group will be focusing on show and tell and word recognition, in order to boost oral confidence and brush up on vocabulary. Where and when is the Superhero Holiday Camp? We will be holding our Chinese camps at Bedok and Serangoon, and click here to see list of timings. Class size is limited to 8 children per class for 3-6 year olds, and 10 children per class for 6-8 year olds. Slots are limited, so fill up the form to secure a place for your child now! Sign up before 12th May to enjoy a special early-bird discount! Fill up the form to find out more!